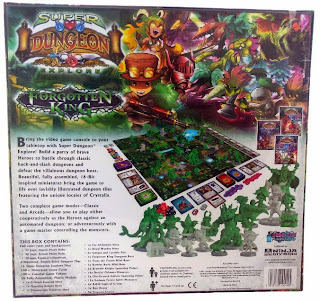 Super Dungeon Explore: Forgotten King is the latest release from Soda Pop Miniatures and Ninja Division and is a miniatures-based board game. 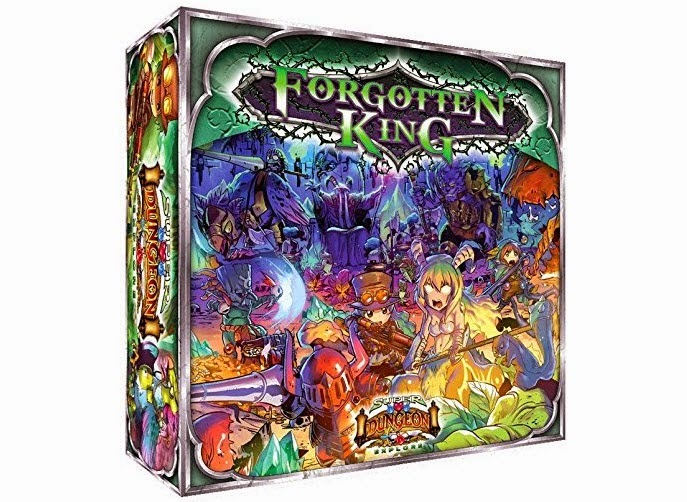 The Forgotten King "expansion" is less of an expansion and more of a 1.5 "re-release" where you have additional content and game modes as well as tweaked rules. With the success of the original release, Super Dungeon Explore: Forgotten King looks to expand the lore-heavy, fast-paced "hack-and-slash" style dungeon crawling world of Crystalia. Does it succeed? When I first received shipment of Super Dungeon Explore I was almost confused; here was this large box that weighed what felt like a metric ton, yet looking over the materials it just does not seem to computer. The miniatures, of which there are 58, are fairly standard in size (25mm to 45mm in height, with some taller and some smaller) and add to the heft weight. The real weight comes in the form of the six fully illustrated and very sturdy double-sided dungeon tiles, 150+ game tokens (plus another 150+ double-sided tokens), all are made out of the same sturdy cardboard. Included in the box are three books, the first is the explorer's handbook, then the classic mode instructions manual as well as the co-op arcade mode rulebook. For those that are interested in immersion and lore, I STRONGLY recommend you read the 20-page Explorer's Handbook as it lays out the history of Crystalia as well as the major players and the whole "why" of the game. Honestly, after my first game I could not help but be amazed at how fleshed out the world actual felt. I would even say that the care taken into story and lore in Super Dungeon Explore is just as good as any mainstream RPG found on gaming consoles/computers. Setting up does take some time, but no different than say, setting up a quick new campaign in a round of old-school tabletop D&D. The first game took longer, naturally, as we were reading the directions of the Arcade mode (more on the two modes later on) and needed to familiarize ourselves with the rules and setup. Once we got the hang of it though, the Heroes can be set up and things on a roll in a quick 10 minutes or so. The setup varies slightly between the two modes (Classic and Arcade), though the basic dungeon setup is random, based on rolling of a D6, so dungeons are rarely, if ever, identical. Once your dungeon is built you would place the start location. One thing to differentiate the different modes is that in Classic mode the Heroes enter the dungeon last, versus the Heroes entering the dungeon first in Arcade Mode. In Arcade mode, while "building" the dungeon, you can place any monster on a monster spawn point, but in Classic mode it is more structured and certain monsters must spawn at certain times. This style of dungeon building is similar to how in some PC dungeon crawlers you will have games where the levels are random and have a random pile of bad guys that spawn at different times (Arcade mode in SDE), or, as in Classic, the dungeon that you are running through has per-determined enemy spawns. Truthfully the parallels between video game dungeon crawlers and Super Dungeon Explore are amazing and really had me feeling like I was physically playing a Diablo / Torchlight clone. Once you have your dungeon set up and monsters spawned it is a matter of getting into the actual game. Just like any good RPG video game monsters have skills, strengths and weaknesses which will all come into play while you are moving through the dungeon. Other things to note is that some tiles will cause status effects, such as a bramble which will impair the unit standing on that tile (unless, like frog knights, they have buffs like Sure-footed that allow them to ignore movement effects like that). While there are a bunch of enemies with various skills and capabilities, the Heroes too have various skills and capabilities based on their class (Knights are able to soak up or dish out a bit more damage, that sort of thing), though one thing that I absolutely loved was the concept of Wrath in the Arcade Mode. Think of this as 'aggro,' just like you would find in MMO games or more modern Western RPG games. Managing wrath can be key to ensuring hero longevity so be sure to keep your eye on it as you play. Like most board games there are various phases and turns that depict what you can do; when you break it down though, it is pretty simple and can essentially be considered hero turn and consul turn. Combat is fast and simple and is designed to get in, attack, and get out. 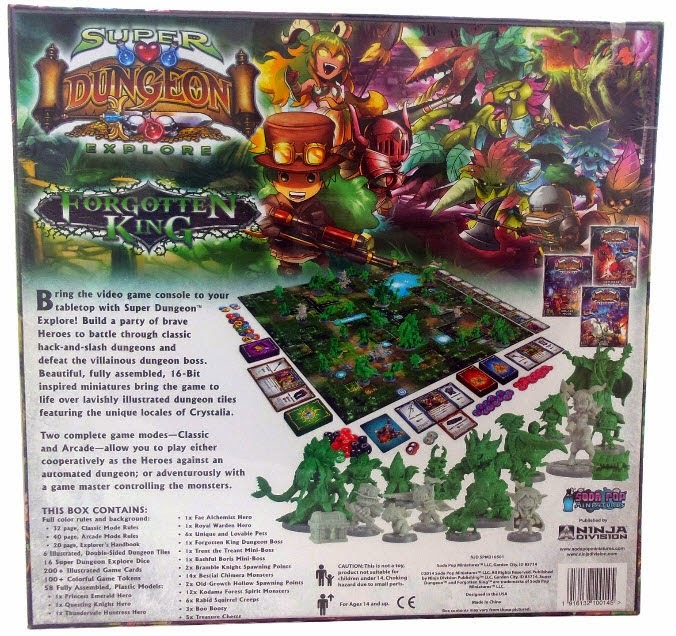 With the fast-paced combat design, games in Super Dungeon Explore: Forgotten King can last anywhere from about 40 minutes to 2 hours (depending on how large your dungeon is and how many players are in game). Fortunately the massive handbook and the easily understood instructions help move the game along and more seasoned players will be able to get through smaller games a bit quicker than newer players, though the instructions are simple enough that after a game or three, even "new" players will be well practiced, whether you are playing Arcade mode or Classic mode. On top of the basic concept of who has the highest rolls to determine a winner there are numerous treasures and buff/de-buff cards that you can pick up in your travels that will help you (or the monsters/bosses) defend or attack or it will enhance the various character abilities. While I am skimming over the sheer depth of Super Dungeon Explore: Forgotten King, the most important thing to take away is that it feels like you are playing a physical, non-digital dungeon crawler. There were dozens of moments where I felt like I was running through a level in Torchlight or Victor Vran or even Diablo, as the fast-paced, simple-yet-deep combat, and sheer attention to detail that SDE shows is simply amazing. This is, by far, one of the best board games I have ever played, ranking up there with classics like Battlemasters and HeroQuest as well as more modern board game giants like Zombicide and Sedition Wars: Battle for Alabaster.